Fai un po 'di ricordi di arrampicata su canyon in questa escursione guidata di mezza giornata, guidando attraverso il Canyon delle scimmie. Completa quattro incredibili discese lungo i pendii del canyon e ammira lo scenario epico attorno al vulcano Arenal. Attraversa torrenti freschi, pareti rocciose e attraversando un ponte sospeso e osserva la copertura forestale da una corsia. My wife and I did the Spider Monkey Canyon tour while visiting the La Foruna area in July. This is typically the rainy season and it was raining on the day of our tour. With the weather being overcast and rain in the forecast we were fortunate to be the only 2 people on the tour. We had 3 guides and a photographer accompany us throughout the day. Simply an amazing and professional experience. We always try to do activities that we have not done before and we definitely were able to satisfy this quest. 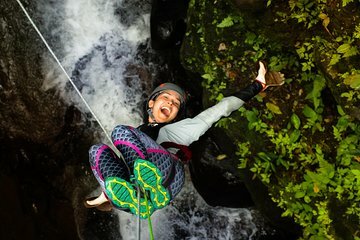 The tour consist of 4 waterfall rappels a zip line and several river jumps. The Canyon is breathtaking, the guides are safe, knowledgeable and fun. Lockers, towels, water, coffee, and hot showers are also offered for guest use.